Formula 1 will all but disappear on free-to-air television in Italy this year. If you don't live there and think that does not impact you, think again. It could be a vision of the sport's future in many more countries than that. It is, for example, similar to the situation the UK will face from 2019. 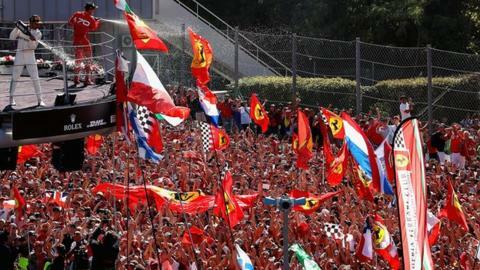 Italy is important as a general marker of the way things are going under Formula 1's new owners because it is the second biggest TV market in Europe. It is also the home of F1's most famous participant, Ferrari, which is effectively an Italian national team. National public broadcaster Rai has carried F1 since 1953. Not so long ago, it showed the whole season live. But the number of live races had reduced in recent years. It showed nine last year, about the same number as on free-to-air TV in the UK since 2012 under the split contract between Sky and first the BBC and now Channel 4. Rai was not mentioned in F1's announcement of its new three-year deal in Italy on Thursday. Four races will be shown live on Sky Italia's free-to-air channel TV8, which does not attract anything like the same audience as Rai. The other 17 will be behind a pay wall on Sky. Italian sources say they believe the Monza race will end up being shown on that channel, but this is unconfirmed. Why did Rai lose the rights? The word leaking out of F1 is that Rai did not come up with a satisfactory financial proposal. Sources close to Rai dispute this, saying that F1 never appeared interested in doing a deal, there were no negotiations worth the name, and no figure was ever put on the table. F1 does not deny this, merely says it does not comment on commercial talks. Leading teams contacted by BBC Sport refused to comment on the deal, but it does not take a great leap of faith to understand Ferrari, particularly, will not be especially happy. The same would go for other teams to whom the widest possible exposure is an important part of the reason for their participation in F1 - especially Mercedes and Red Bull. Is this part of a general trend? Elsewhere, the picture varies, within narrow parameters. There were fears towards the end of last year that F1 would also disappear from national free-to-air TV in Germany, the biggest market in Europe. But despite an offer from Sky described as "eye-watering", and interest from Amazon, in the end a new three-year deal was struck with national broadcaster RTL to broadcast all races live. Sky's pay coverage is ending, but is being replaced by a streaming service from F1 itself. In France, F1 will be back on free TV to a limited degree in 2018 for the first time in six years - four races will be broadcast live on the nation's biggest channel TF1, in addition to subscription-only Canal Plus. But in Spain there is no free-to-air coverage, despite Fernando Alonso's status as a national hero, and a new deal has been struck with pay channel Movistar. In the USA, network broadcaster NBC decided not to carry on with F1 after the end of its contract last year because it did not want to "enter into a new agreement in which the rights holder itself competes with us" - a reference to F1's plans for its own streaming service there, too. From this year, F1 will largely be on cable channel ESPN, with only the US and Mexican Grands Prix broadcast live on network on ABC. F1 says it is pursuing a mix of free-to-air, pay TV and OTT (internet streaming), and that the specific solution will be different in each country. But in being tempted by pay TV to boost income, it is no different from many other sports. There are, though, unanswered questions as to the effect of that on the health and sustainability of F1. Going pay TV increases revenues, which filter through to the teams. But reduced audiences make it harder for teams to attract sponsorship. Is the one enough to offset the other? Equally, smaller audiences make the sport less attractive for big companies - reducing the benefit the likes of Mercedes, Ferrari, Red Bull and, to a lesser extent, McLaren see from competing in F1. Could this threaten their participation in the sport? F1's new bosses have talked about growing the sport. But by this do they mean its revenues or its audiences? They say both. But are they mutually incompatible? To take the UK as an example, the average audience in the last year of the BBC coverage in 2015 was 3.1m. Channel 4's was 1.9m last year. Sky's in 2017 was 652,000. When F1 goes Sky-exclusive in 2019, it will get a huge boost in income - the deal is said to be worth upwards of £200m a year. But the UK TV audience is likely to have dropped by about 80% in four years. That is likely to have a significant effect on its appeal and stature as a major sport. And as the UK is home to the majority of the teams and is one of the most successful countries in terms of wins and world championships, it could seriously impact its ability to attract the next generation of drivers, engineers and so on. If this drop was extended worldwide, F1 would no longer be able to legitimately claim that it was the world's most-watched annual sport, and behind in global terms only the Olympics and the Fifa World Cup. F1 plans to mitigate the same free-to-air audience fall with its OTT offering. This is where sport's governing bodies offer subscribers direct access to live coverage broadcast over the internet via a website or an app on both mobile devices and smart TVs. The philosophy is that ardent fans will pay the cash for the extensive coverage and that short clips on social media outlets might persuade more causal viewers to try the sport out, and then be subsequently hooked. OTT has had significant success in the US with NFL football, Major League baseball and the Ultimate Fighting Championship. But it is in its infancy in Europe, which is F1's heartland, and the success of that approach remains to be seen, the growth of streaming notwithstanding. In any case, OTT is not possible under the terms of the Sky deal in the UK, which runs until 2024. Could a full night race in Bahrain and different camera angles to showcase speed entice fans to watch on TV? Are things changing on TV for this year? US group Liberty Media bought F1 last January and spent a year finding their feet. In 2018, the new owners have their first chance to begin to show the direction the sport is heading in the future. Or to quote one senior figure: "This is the year we get to see whether what they're doing works." In TV terms, a number of changes are being contemplated. These were presented to broadcasters as unconfirmed plans at a meeting this week. Some of these are easy wins. Others are less likely to be universally welcomed. The changes to TV are just the beginning of a wide-ranging review of the sport being conducted by Liberty with the aim of making it look very different on many levels by 2021. Right now, though, no one yet knows the shape it will take, or how successful the changes will be.